In a major embarrassment to the Indian Army, the national flag was held upside down at a function in presence of senior army officers in Rajouri district of Jammu and Kashmir. "A felicitation ceremony was organised by Territorial Army Battalion for meritorious students from Rajouri district on 22 Jun 2015. 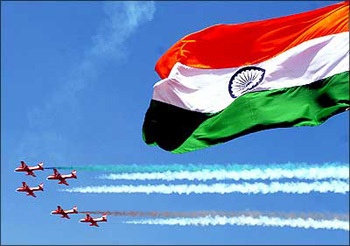 On termination of the event during a group photograph, inadvertently the national flag was held upside down", public relations officer, Defence, Lt Col Manish Mehta said in Jammu on Wednesday. Army authorities regretted the mistake in this regard. "The mistake is deeply regretted", Lt Col Mehta said. The Territorial Army Battalion, under Romeo Force, had on Monday felicitated meritorious students of the remote rural villages of Rajouri district in the state. During the felicitation ceremony conducted at Palma in Rajouri, students from the area who had performed well in X and XII standard exam were invited. Wife of Major General AK Sanyal, General Officer Commanding, Romeo Force, awarded merit certificates, cash prizes and monogrammed diaries to the students during the event attended by number of people including the students' parents, teachers and other citizens.